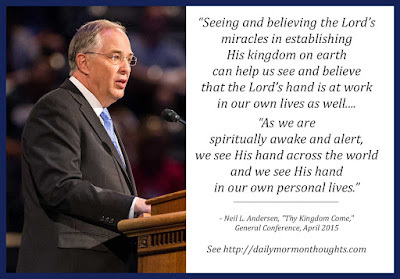 "Brothers and sisters, seeing and believing the Lord’s miracles in establishing His kingdom on earth can help us see and believe that the Lord’s hand is at work in our own lives as well. "The Lord declared, 'I am able to do mine own work.' (2 Nephi 27:20.) We each try to do our part, but He is the grand architect. Under the direction of His Father, He created this world. 'All things were made by him; and without him was not any thing made that was made.' (John 1:3.) 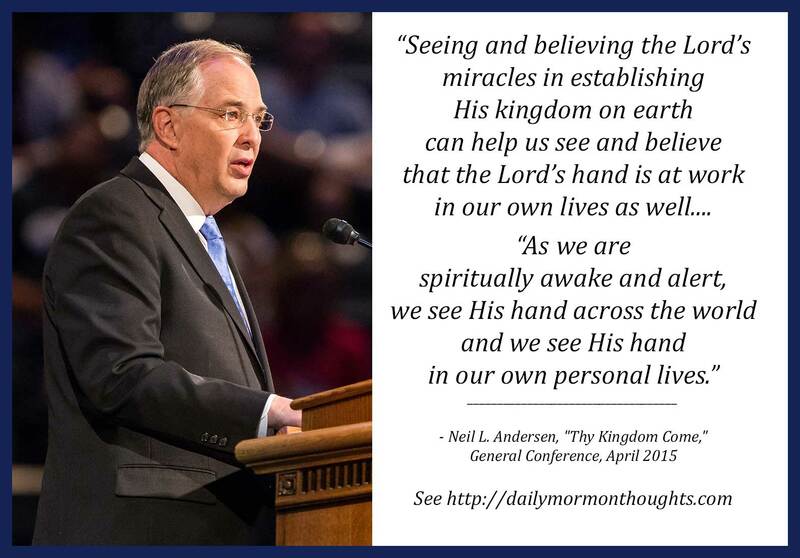 As we are spiritually awake and alert, we see His hand across the world and we see His hand in our own personal lives." I love the description and challenge contained in this phrase: "As we are spiritually awake and alert...." One who is spiritually awake is watching and noticing the spiritual things that are occurring in his life. Too often, we are dozing or distracted and don't even recognize God's hand as it influences our path, gives us help and encouragement, and blesses our lives. We need to awaken and be watching, and we'll be blessed to see that divine influence more than we expect!